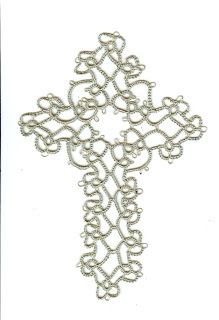 This year for Christmas I hope to make some tatted items for my sisters. So far I have completed this cross. It is from Mary Konior's Tatting With Visual Patterns. This was made with size 30 Sage Green Cebelia' thread. It didn't take very long to complete, I think I did it over two evenings. But there were not any difficult elements to work. I hope to complete a couple of bookmarks for my other sisters. I love that book by Mary Konior! Sometimes a simple pattern is best when there's a lot of Christmas presents to be done!